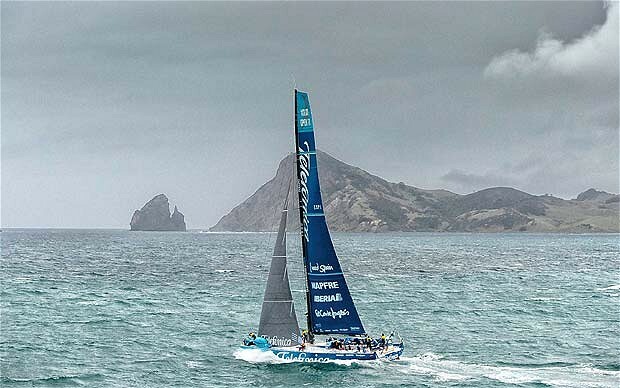 The protest hearing over Telefonica’s sails that could impact on their chances of an overall victory has been set for April 18 in Itajai, Brazil. The international jury will convene to hear a protest by race measurers who are believed to have found an extra headsail on board Telefonica at the end of Leg 4 from Sanya to Auckland, which constitutes a serious breach of the Volvo Ocean Race rules. Since the introduction of class racing in 1993, when the fleet of Whitbread 60s competed, sail suits for each boat have been restricted though the limits have changed with each edition of the race. In this race, a limit of 17 was imposed for each Volvo 70 but the headsail count on Telefonica, which included one storm trysail, one storm jib and one heavy weather jib was believed to have been exceeded. The jury will take intent, or lack of it into consideration during their deliberations but according to race officials, disqualification or a fine are an unlikely outcome while a points deduction or some other unspecified penalty could be imposed. Telefonica finished Leg 5 in second place to extend their overall lead over Groupama to 20 points. But with just 43 points separating the top four boats and so many points still up for grabs from the four remaining legs and three in port races, a substantial points penalty could hinder Telefonica’s title hopes.